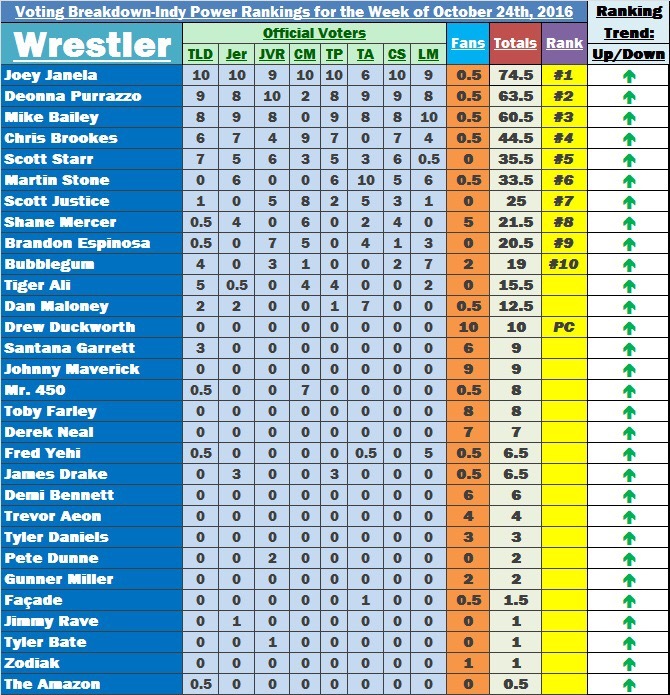 Who should be #1 in the Tag Team Top 5 for the Week of 10/31/16? 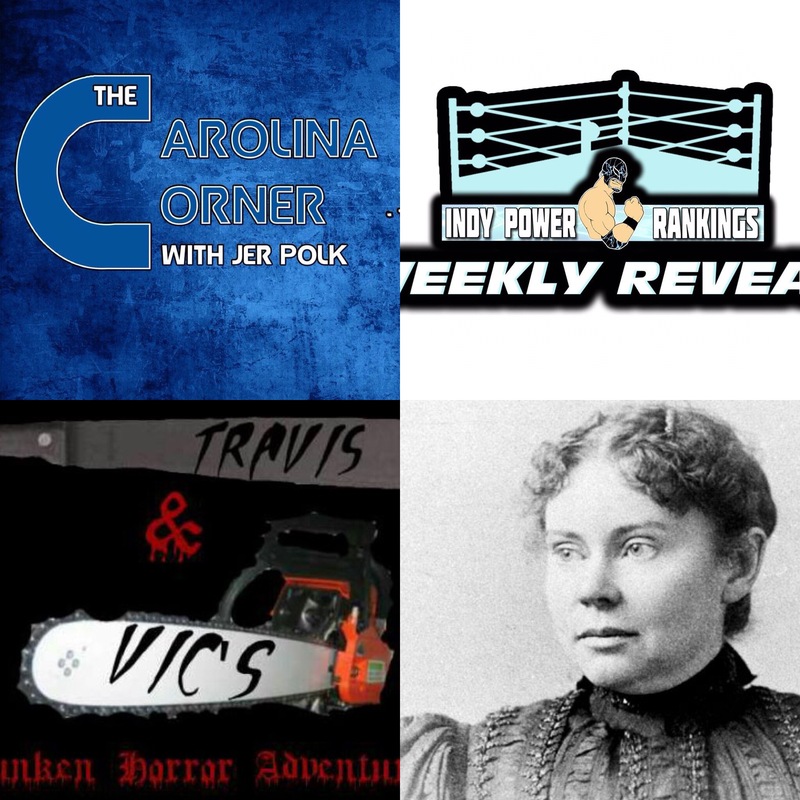 Who should be #1 in the Indy Power Rankings for the Week of 10/31/16? #2 Team IOU (Kerry Awful & Nick Iggy @TeamIOU)-Consistency has been the key to “The Carnies” success this year as they have been quietly picking up wins in every single promotion they travel to. 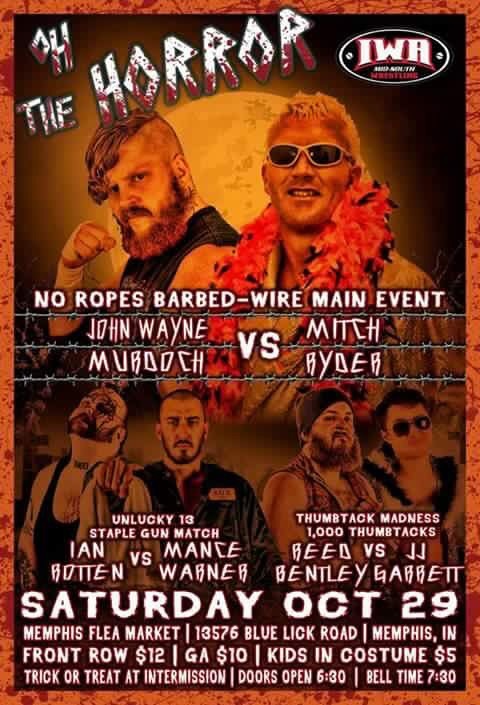 Their winning ways continued this past week as they defeated Cutie And The Beast (Beau Crockett & Innocent Isaiah) at NOVA Pro on 10/22 and then defeated The Insiders (Ace Perry & Slade Porter) at Atlanta Wrestling Entertainment on 10/23 to go 2-0 for the week. 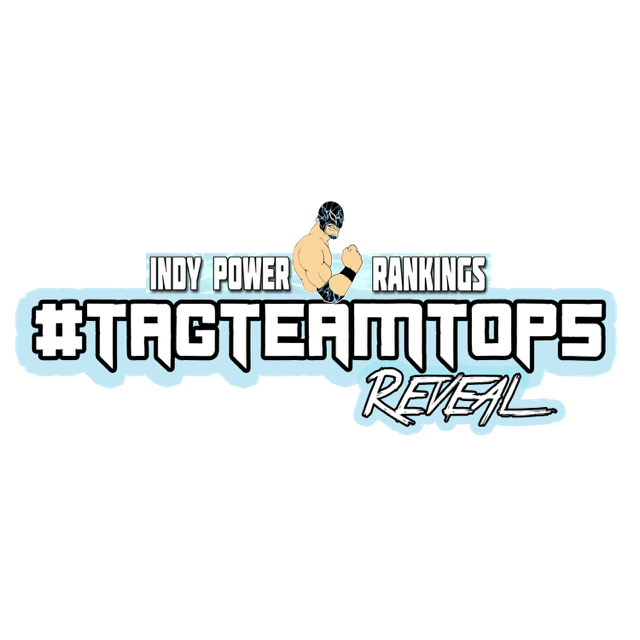 Team IOU are looking to keep pushing until they get their highest ranking ever in this year’s Tag Team Top 50, which would be impressive since they were #4 in 2014 and 2015. Will this be the year they finish the year in the Top 3? Things are looking good for the former Boy and his Dog as they continue to grow as a team. 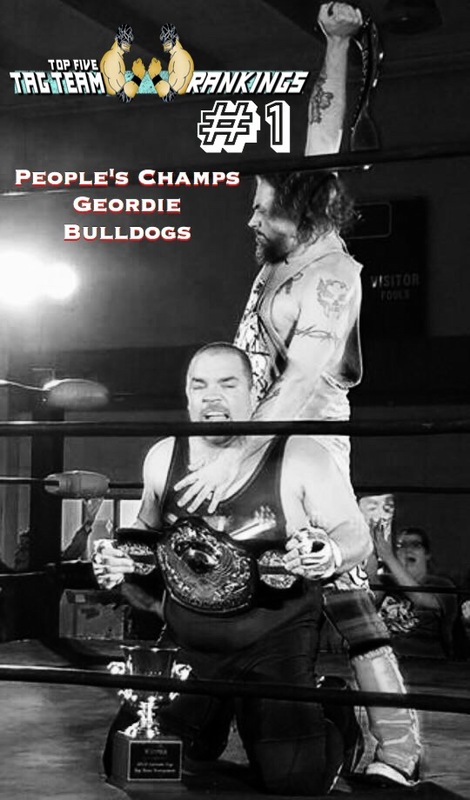 #3 The Rude Ones (Bulldog McKenzie & Marvel)-It’s a first-ever ranking for the NEW Riot City Wrestling Tag Team Champions this week. They became the inaugural champions after they defeated Light Speed Express (Mat Diamond & Robbie Eagles) in the semifinals on 10/22 and then defeated Bestos (Adam Brooks & Kellyanne) in the final the same day to win the tournament. The promotion out of Adelaide, Australia crowned their first champions as McKenzie & Marvel ran through the competition with an impressive day of victories. This masked tandem have a chance to really start making an impact in the Top 5 if they can use this momentum to continue to defend and retain their titles. They were also #5 in the online voting competition with 21 votes. #4 Prince & Property (Prince Akkanatan and Aaron Bradley)-We get another first-time ranking this week in the form of Prince & Property. They won the 9th Annual John J. Iradi Memorial Tag Team Tournament over the weekend as they defeated Taboo Crew in the first round, then defeated Pretty & Gritty in the semis, and then defeated The Airtime Rockers in the final at UPWA on 10/22 to win the tournament to become #1 contenders with a 3-0 record for the week. GREAT week for this team as they enter the Tag Team Top 5 with a solid first ranking. Like The Rude Ones, if they can build on this ranking, perhaps you’ll see them in the year-end Tag Team Top 50. 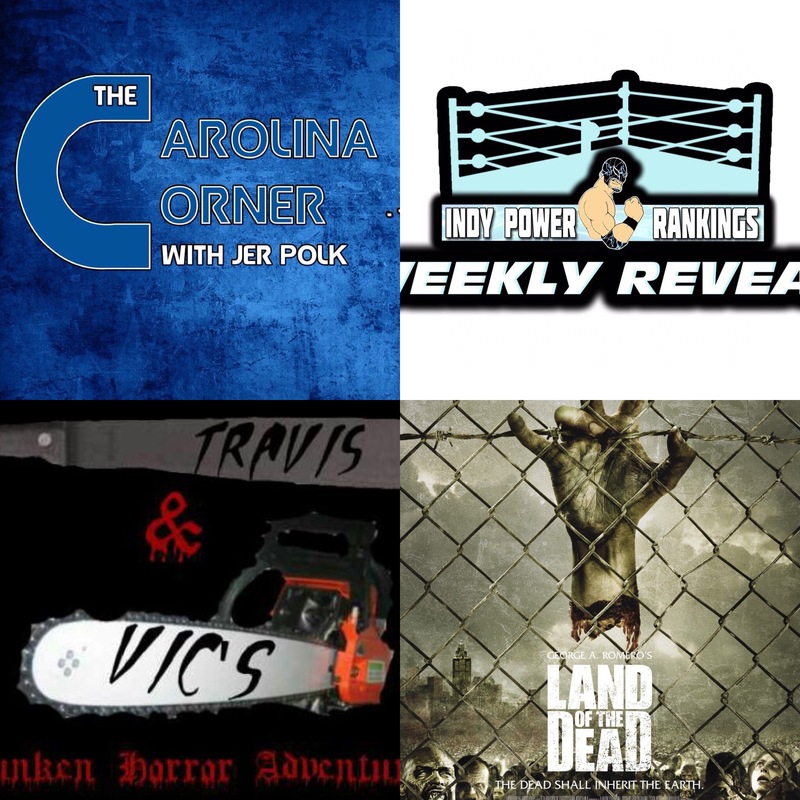 #5 The KRAKEN (Chip Day & Murder-1)-The AWE Tag Team Champions are ranked #5 for a second straight week. This was a week where they accomplished something pretty special in the grand scheme of things. They defeated The Sound and the Fury (Joe Black & Will Huckerby) at AWE in a titles vs. partnership match which led to them of course retaining the titles and forcing The Sound and The Fury to break up. If you’ve followed the Indy Power Rankings and the Tag Team Top 5 this year, you’ll know that beating the Sound and the Fury and forcing them to break up is a HUGE deal. Big enough to get the KRAKEN right back into the Tag Team Top 5. This tag team is on fire right now and it looks like no one can stop them! They also came in third in the online voting competition with 66 votes. 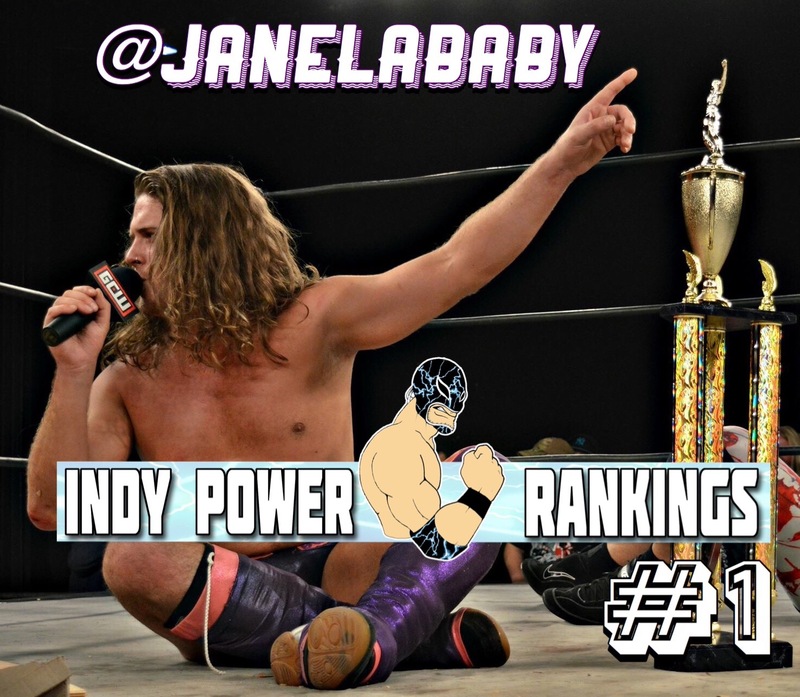 #1 Joey Janela (@JANELABABY)-That bad, bad boy has done it again as “The Bad Boy” Joey Janela won GCW’s Trent Acid Cup over the weekend to get another #1 ranking and his first this year. He beat Indigo Chyld, Teddy Hart, and Travis Gordon in the First round, then beat B-Boy in the semi-finals, and beat Pinkie Sanchez in the finals to go 3-0 and win the tournament. His #1 ranking is particularly impressive as this week was INSANE with competition. Multiple tournaments, title changes, and multi-win weeks for many of the competitors made it very difficult to determine a fair Top 10. In the end, it was Janela that beat everyone out for the top spot as he continues to set the independent wrestling world on fire in 2016. #2 Deonna Purrazzo (@DeonnaPurrazzo)-After winning the ECWA Women’s Super 8 last year, Deonna Purrazzo found herself with her first-ever #1 ranking. One would think that after winning it for a second straight year, she’d be #1 once again, but it wasn’t to be this time around due to the heavy competition that propelled Joey Janela to the #1 spot. It’s absolutely no disrespect to say that Deonna’s opponents weren’t quite as established as The Bad Boy’s as the ECWA and DCW Women’s Champion went through Tasha Steelz, Kiera Hogan, and Karen Q to win the tournament. Regardless of some disappointment of being ranked at #2 instead of #1, make no mistake, this is still a VERY prestigious ranking for one of the best women’s wrestlers on the indies today. #3 Mike Bailey (@speedballbailey)-Mike Bailey was an absolute WARRIOR this past week on the indies. He defeated Daiki Shimomura at DDT on 10/17, then defeated Mizuki Watase on 10/18, then lost to Guanchulo on 10/19, then defeated Nobuhiro Shimatani on 10/20, then defeated Ryota Nakatsu on 10/21, then defeated Kazusada Higuchi the same day to win the DNA Grand Prix 2016 Tournament and then traveled back to Canada where he beat Evil Uno & Stu Grayson in a Triple Threat at Smash Wrestling to go 6-1 for the week. It’s obvious that his only blemish on his record is the only thing that cost him the #1 ranking, but he did get some support from the official voters at the #1 spot. The former #1 has all the momentum right now, but wow, you’d think he could use a vacation! #4 Chris Brookes (@OBEYBrookes)-This independent “British Wrestler Extraordinaire” dominated some top-flight talent over the weekend in the UK as the VII Pro British Lions Champion and ½ of the Attack! Tag Team Champions beat Shane Strickland at Fight Club Pro on 10/21, then beat Kimber Lee on 10/22, and then defeated Fire Ant on 10/23 to wrap up his week at 3-0 for the week. On any other week those victories would have been enough to earn him the #1 spot, but this week again was absolutely incredible. Getting a #4 ranking this week is a HUGE accomplishment considering all of the talent vying (and worthy) for the top spot this week. #5 Scott Starr-Much like the competitors ranked from 2-4, on any other week Scott Starr’s accomplishments likely would have earned him a #1 ranking. He won the UK Future 8 Tournament at IPW: UK where he became All England Champion after beating Danny Duggan on 10/22 in Round 1, then Robbie X in the semi-finals, and Sammy Smooth in the finals to win the tournament. His big tournament win was just overshadowed by there being soooo many tournaments last week. Hopefully Scott Starr can really use this ranking as something to build on in order to pick up some more rankings before the IPR 100 hits! People’s Champ. 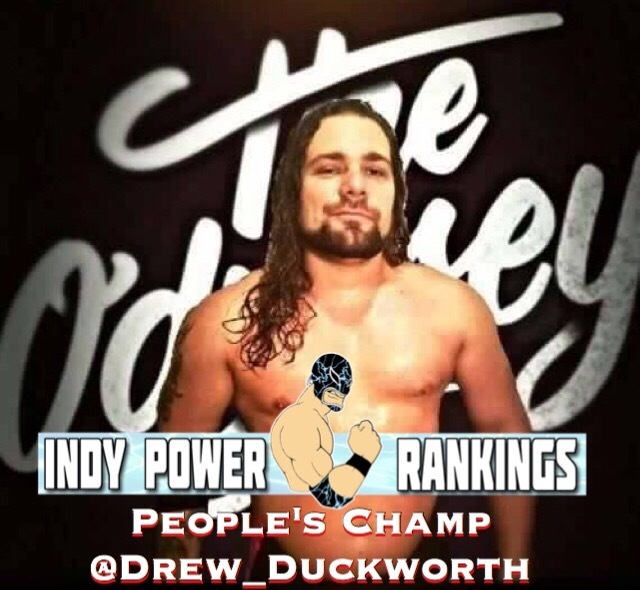 Drew Duckworth (@drew_duckworth)-We’ve seen Duckworth a few times in the tag team rankings, but this is his first time being mentioned in the singles Indy Power Rankings in one form or another. He is the People’s Champ this week after winning the online voting competition with 84 votes after earning his way in with victories vs. Jacob Ashworth at APW on 10/21 and Stryk Nyn at GPW on 10/22. A 2-0 week gets Duckworth on the poll and of course his fans made sure he took home his first win in the online voting competition. Who should be #1 in the Tag Team Top 5 for the Week of 10/24/16? Priscilla Kelly defeated Kiera Hogan, Ashton Starr, and Angel Blackwell in 4-way ROAR action.